Capital “L” Liberalism—the reign of the Liberal Party of Canada—was certainly rudely interrupted this past decade. It deserved to be, with its scandals and backroom deals. But did our small “l” liberalism, for which the country had been distinguished, deserve to be rudely interrupted? Hardly. Has not the world been seeing enough of the bullying of big office by the likes of Bush, Cheney, Netanyahu, Putin, el-Sisi, and Erdogan, with more all the time? Did Canada really have to chip in too? And within the country, did we really need an intensification of the mindless dogma that is now creating so much havoc across the world, with its presumptions that greed is good, markets are sacred, governments are suspect, and all the resulting entitlements are necessary? The world needs quite the opposite, and Canada had been one of the countries bucking the trends that have been undermining democracy. 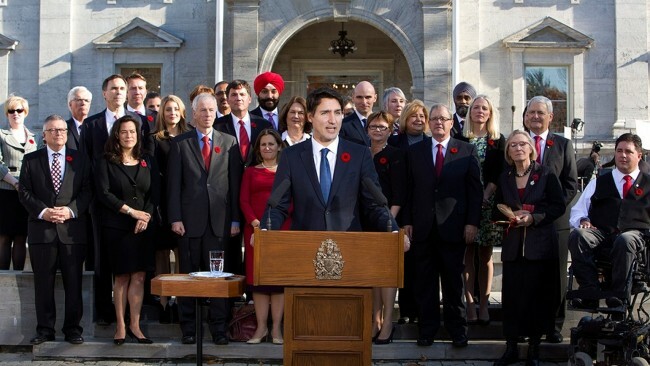 So it’s good news that “Canada is back!” as the new prime minister put it on the podium election night in October. At home and abroad. Of course, that particular Canada never really left; it just hunkered down. Thanks to our small “l” liberal democracy, at the end of the Harper decade the CBC remains a model to all of what non-corporate media can be; our Supreme Court remains as progressive as is the American one regressive; and only one of our ten provincial governments can be called conservative. Now Justin Trudeau is defining Canada, at home and abroad. But of course, Canada has defined Justin Trudeau. It is difficult to imagine anyone who is more quintessentially Canadian, in his open, thoughtful, and thoroughly bilingual style. Leadership does not turn us into something that we are not, but it can bring out the best that is within us. In Canada, that has been to look out with compassion and good sense, in the pursuit of balance in a world that now so lacks it. Can he keep this up? Time will tell. But there is one especially encouraging sign: interesting ideas are bubbling out of this administration. How refreshing: we have a creative politician at the helm! How many other countries can claim that? After enduring all those lawyers, economists, academics, and corporate types for decades, now we have a schoolteacher running the government. Have we not always prided ourselves on our diversity? Justin Trudeau had a hard time early in the election campaign. Too many people were taken in by the Conservative propaganda that he is a lightweight—including a corporate press that lives in mortal fear of the private sector losing its entitlements. Even an old Liberal friend told me a couple of years ago that the Party will be doomed when people discover the truth about Trudeau. Well, during the long election campaign enough Canadians discovered the truth about Trudeau! Now the rest are. Of course the honeymoon will soon be over. The devotees of democratic capitalism (notice what’s the noun), having failed to stop the surge, are waiting in the trees, like panthers, ready to pounce—to take Canada back. They will find reason, whether or not justified. Balance between social and economic needs is not high on their agenda. I wrote in last week’s TWOG that people in positions of authority are flawed, like the rest of us. They succeed when these flaws are not fatal under the circumstances. So we shall have to wait and see. Some people succeed despite their flaws, while others are brought down by their flaws (as was our last prime minister). As noted, Justin Trudeau took to the stage on election night to announce that “Canada is back!” Not a moment too soon. Small “l” liberalism is back, and the world may well benefit. To paraphrase from our national anthem, we need to keep our land glorious and free, so that thee, O Canada, can stand on guard for a better world.